If TV commercials and magazine ads are to be believed, testosterone levels in American men are plummeting to rock bottom faster than an anvil dropped from a cliff in a Road Runner cartoon. Based on the hype, it would be easy to be fooled into thinking “low T” affects every man, everywhere, and that the only thing to be done about it is to hightail it to a doctor’s office and get a prescription for hormone replacement therapy. Available via injection, skin cream, pills, or a patch, testosterone replacement therapy (TRT) is effective, but it’s not without its risks, some of which are as serious as increased risk for heart disease, deep vein thrombosis and pulmonary embolism, gynecomastia, benign prostatic hyperplasia (BPH), and growth of existing prostate cancer. (TRT is generally contraindicated in cases of prostate cancer.) With this in mind, it may be wise to start with natural ways to boost testosterone, and turn to pharmaceutical methods only if the natural strategies fail to help a guy get his mojo back. While testosterone levels in American men may not be bottoming out across the board, levels of this androgen do decline naturally with age. It simply isn’t logical to expect an 80-year-old man to be the virile specimen he might have been at 25. However, what is especially noteworthy about trends in declining testosterone levels is that decreases are occurring in men ever younger. Signs and symptoms of low testosterone—such as insomnia, infertility, low libido, weight gain, low energy, depression, and trouble concentrating—can be devastating, so it’s understandable why men who do have “low T” want an easy, convenient, and quick solution. Who wouldn’t want to optimize levels of a hormone that supports things as diverse as healthy libido, acquisition and maintenance of muscle mass, good energy levels, motivation to get things accomplished, and more? Testosterone levels rarely decline for no reason. Underlying pathologies or other hormonal imbalances may come first, and lower testosterone is simply a downstream affect. Certain medications, obesity, inflammatory conditions, and physical and emotional stress can result in reduced testosterone. 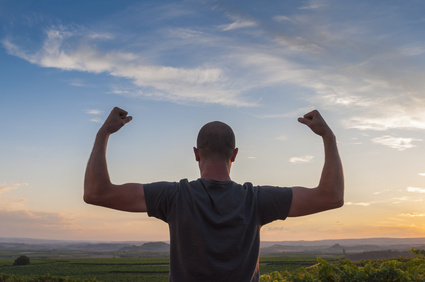 For these reasons, from a functional medicine perspective, it is reasonable to start with diet and lifestyle interventions that can help boost testosterone as a natural byproduct of addressing the root cause, rather than using exogenous hormones as the first course of action. Stress management: This includes getting good quantity and quality of sleep. According to one study, testosterone increases with increasing sleep duration up to 9.9 hours, after which it decreases, resulting in a U-shaped curve. Obstructive sleep apnea is associated with lower testosterone levels, and in older men (ages 64-74), total evening sleep time is associated with higher morning testosterone levels. In addition to sleep, overall stress reduction is key to supporting healthy testosterone levels, because cortisol may be antagonistic to testosterone. Exercise: Weightlifting or resistance training of moderate-to-high intensity has been shown to boost testosterone. Short bursts of intense sprinting have also been shown to elevate plasma total testosterone. There is a time and place for TRT. As with any other medical intervention, context is crucial. But to opt for TRT without addressing why testosterone is low may cause the underlying health issues to get worse. If low T is a byproduct of poor diet, inadequate physical activity, or unrelenting stress, if left unaddressed, their adverse effects may eventually lead to low testosterone being the least of a man’s concerns.